A pillar candle consists of large heaps of wax surrounding a large wick in the center. The pillar candle can have a scent infused throughout it or may be unscented. 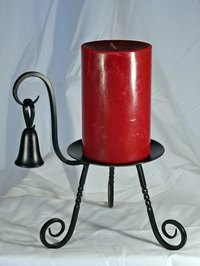 The pillar candle can be shaped and molded to any design that you want. You can purchase the candle in the specific shape you want, or you may have it shaped to a personalized shape. Light the candle with a lighter. Wait 5 minutes so the wax can warm. Push the wax inward with your fingers to begin forming a shape you want. Grab the candle with both hands, and slightly squeeze the candle on both sides. Blow the candle out. Wait 1 minute. Shape the top of the candle by pushing the warm wax into a desired shape. Heed caution when working with hot wax because it may burn you.